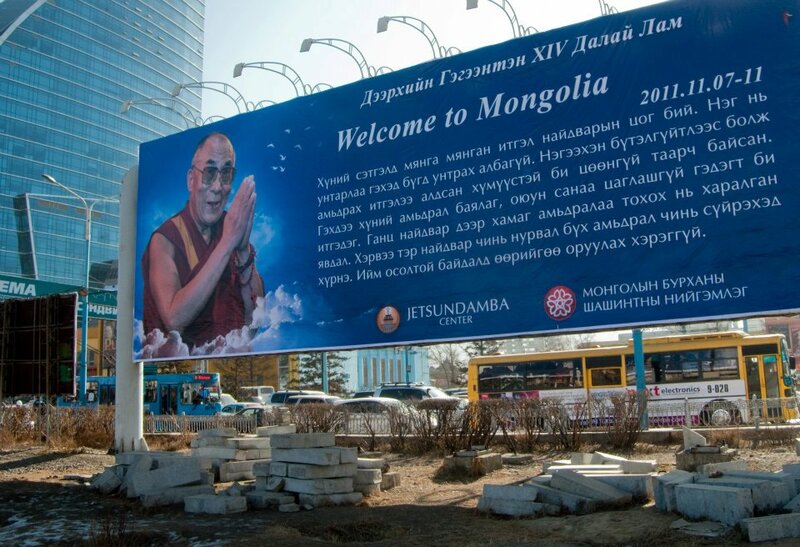 (TibetanReview.net, Aug21, 2014) –A planned August visit by Tibet’s exiled spiritual leader, the Dalai Lama, to Mongolia’s capital Ulan Bator was cancelled due to the fact that Chinese President Xi Jinping was also visiting the country, reported Kyodo News International, citing multiple sources. Xi’s visit takes place over Aug 21-22. Preparations were reported to have been on since the beginning of this year for the Dalai Lama to visit the country to confer a Kalachakra empowerment, one of the most important mass rituals in Tibetan Buddhism, to a large crowd of devotees. He previously conferred one in the country in Aug 1995 to a crowd of 30,000 followers. The report cited sources as saying preparations for what was to be his ninth visit to the country since 1979 were suspended after a plan for China’s leader to visit Mongolia the same month emerged and began to take shape. The Dalai Lama’s last visited Mongolia, the majority of whose population follows Tibetan Buddhism, in Nov 2011, drawing protests from China. The report said Xi was invited by Mongolian President Tsakhiagiin Elbegdorj to visit his country at an early date when the two met in Shanghai last May on the sidelines of a regional meeting. During that meeting, China’s official Xinhua News Agency quoted Xi as having told his Mongolian counterpart that as good neighbours and partners, the two countries should support each other’s “core interests and major concerns.” It also cited Elbegdorj as having responded by saying Mongolia would continue to firmly support China on Tibet-related issues and Taiwan-related issues, both of which China consider as “core interests”. Xi was reported to have described the two countries’ economies as highly complementary and expressed China’s willingness to promote Mongolia’s mineral resources exploitation and infrastructure construction, while extending financial cooperation and encouraging Chinese enterprises to invest in Mongolia. The report said Mongolia’s Foreign Ministry had not commented on the Dalai Lama’s visit plan, except to say visits by religious leaders had nothing to do with the work of government. However, it cited multiple sources as saying the government, under pressure from China, had requested Tibetan Buddhist circles in the country to cancel the planned events. Landlocked Mongolia is highly dependent on China for the export of its rich mineral resources and for Chinese investment.